This website is a display of my art, poetry, prose, and web design skills. These pages are just for show. I do not currently sell anything here at macjr.com, nor do I plan to sell anything here in the future. I do, however, accept donations to help keep this site online, and ads free. If you are interested in using my art for professional or commercial use, please contact me. For those few who are interested in such things, I currently use Komodo Edit to write my pages. I use a variety of graphics programs to make my art. My main graphics program is Paint Shop Pro, but I also find use for RealWorld Paint, GIMP, and Paint.NET (but beware, the official Paint.NET program is not at paint.net, it is at getpaint.net). I will on occasion, try out other raster graphics programs as well. 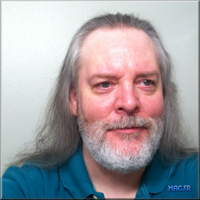 My name is Michael A. Crane, Jr., but I usually go with my initials, MACJR, here online. I have been online since September 1996, and I built my first website, MACJR’S Mini-Verse², on May 30, 1997. I bought my first domain, macjr.com, on June 14, 2000, but did not get its first pages upload until the next day. More about me, I am a self-taught digital artist, or pixel artist, if you prefer. I have never taken a class for making digital art. I did take one basic drawing class at Everett Community College back in 1987, but I had already been drawing for many years before then. Since I bought my first computer, back in 1992, though, I rarely pick up a pencil anymore. I work almost exclusively with pixels these days. I do have some education in poetry and prose. I have taken several creative writing courses at Everett Community College, with Rich Ives as my instructor. Since my college days though, I only write from time to time. I have too many other projects that eat up my time, is my usual excuse for not writing more often. I do have a few writing projects that have been left on hold for way too long. Still, I hold off. It is not yet time to focus my attention back to writing. Not just yet. When I do get back to writing, it will put everything else on hold. The writing will consume me, and all of my time, so I need to be ready for that. I have only taken one college class for making web pages. It was a joke. I literally knew more about making web pages than my instructor did. Some of the students were angry because they learned more from me than they did from the instructor. I have taught myself a great deal more about writing web pages since then. All I really needed though, was some good books, time, and practice. What you see here at this web site now, and at my other sites, is the results. There are volumes more I could write about myself, but I think this will do for now. Besides, you will find out more about me by visiting the rest of my pages. I do hope you like my site(s), and my art (poetry, prose, and visual). Please let me know what you think.